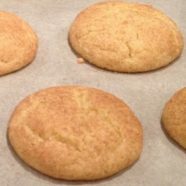 Snickerdoodles occupy a special place in my memory, as this was the cookie that my mom would bake and send to me wrapped in waxed paper and packed in a Christmas tin when I was in college in California, a long way from home in Oklahoma. A popular Southern favorite cookie, the snickerdoodle is basically a soft sugar cookie rolled in a cinnamon-sugar mixture prior to baking. 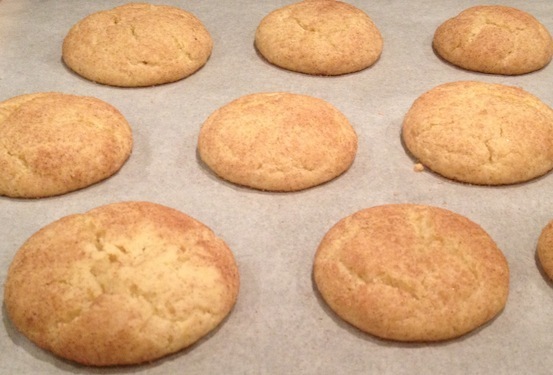 The Joy of Cooking claims that snickerdoodles are probably German in origin, and that the name is a corruption of the German word Schneckennudeln (“snail noodles”), a kind of pastry. I have modified the recipe to omit the use of margarine and reduce the amount of sugar, as it is possible to successfully reduce the quantity of sugar in any recipe by one-third without changing the consistency. We find the taste more agreeable too, and in-line with the general trend away from overly sweet baked goods. Preheat the oven to 400°F. (or 375°F Convect Bake cycle). Line baking sheets with parchment paper. Cream butter until smooth; add sugars, and mix until smooth, scraping occasionally. Beat in eggs. Whisk together flour, cream of tartar, baking soda, and salt; and blend with the butter-sugar mixture, using the paddle of an electric mixer (or mix by hand, the old-fashioned way). Shape into 1-inch balls. Whisk the ¼ cup of sugar and the cinnamon in a shallow bowl. Rolls the balls of dough in the mixture. Place 2 inches apart on the parchment-lined baking sheet. Bake 8 to 10 minutes or until set. Remove cookies to a baking rack to cool.